DAVAO CITY (MindaNews / 14 June) — The supposed resumption of the fifth round of formal peace talks between government (GRP) and National Democratic Front of the Philippines (NDFP) will no longer push through on June 28, after President Rodrigo Duterte instructed his peace panel on Wednesday to engage the “bigger table” first before they would work out agreements with the communist leaders, Presidential Adviser on Peace Process (PAPP) secretary Jesus Dureza said. No date has been set for the resumption. 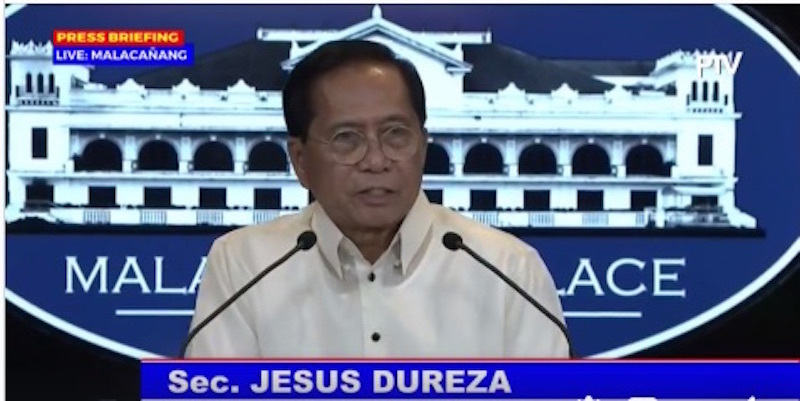 Dureza told a press briefing at the Malacañan Palace on Thursday that they find it equally important to hear out the stakeholders on the ground through consultations to ensure all consensus points and agreements to be forged between GRP and NDFP peace panels would have the people’s support. “So during a meeting with the President last night, and after … inputs from those who are with us, the President said, ‘Let’s reset.’ Give us time to work some more, so that whatever agreement we’ll be able to sign eventually, will be able t to be implementable,” he said. Presidential Adviser on the Peace Process announces to the Malacanang Press Corps on June 14, 2018 that the June 28 resumption of the formal peace talks between government and the National Democratic Front has been reset. Photo screen grabbed from PTV 4’s live coverage of the presscon. NDF consultant Jose Ma. Sison, founding chair of the Communist Party of the Philippines (CPP) said he was disappointed and frustrated the government “unilaterally cancelled” the June 28 peace talks in Oslo, Norway, which was supposed to have been preceded by a stand-down or temporary cessation of hostilities between government forces and the New People’s Army starting on June 21. Sison said government peace panel chair Silvestre Bello III signed written agreements pertaining to the scheduled events with his counterpart, NDFP negotiating panel chair Fidel Agacoili, as witnessed by the Royal Norwegian special envoy Ambassador Idun Tevdt, through a back channel talk held on June 9. He urged the two peace panels to release to the public and to the press the written and signed agreements of June 9 and 10 signed Bello and Agcaoili and members of their respective special teams. He said the cancellation shows government is “not interested in serious peace negotiations” and that it is only interested in obtaining the NDFP’s capitulation under the guise of an indefinite ceasefire agreement and breaking the provision in the GRP-NDFP Joint Agreement on the Security and Immunity Guarantees (JASIG), which requires formal negotiations be held in a foreign neutral venue. “Because the GRP under Duterte is obviously not interested in serious peace negotiations, the revolutionary forces and the people have no choice but to singlemindedly wage people’s war to achieve the national and social liberation of the Filipino people,” Sison added. Dureza explained that they could not just ignore the public, emphasizing that they want to “take full advantage of this last opportunity” that the President gave for the GRP-NDFP peace negotiationsto put an end to the decades-long communist rebellion. He maintained that just, sustainable, and lasting peace could be attained if the people would understand and support these efforts. “Our peace efforts to succeed should have good support from the general public, hence, it is necessary that all efforts be exerted to inform first and engage them in the same way as the government engages the rebels in addressing the root causes of conflict,” he added. To ensure that the last chance will not be “squandered away,” Dureza said they must learn from the failures of the 50 years of “intermittent and often times disrupted” peace talks to prevent similar pitfalls of the past. Dureza added the government panel would consult several sectors, including the private sector, non-government organization, local government units, and Regional Peace and Order Councils, on all consensus points and agreements forged in the negotiations, as they did for the Bangsamoro Basic Law (BBL). “We cannot have a peace agreement and have a vacuum support from the public,” he added. Both parties have yet to thresh out the three remaining comprehensive agreements on Social and Economic Reforms, dubbed as the “heart and soul” of the peace negotiations, Political and Constitutional Reforms, and End of Hostilities and Disposition of Forces. The fifth round of GRP-NDFP peace talks was aborted for the second time just two days before it would resume on November 25 to 27, 2017, with Proclamation 360 of President Rodrigo R. Duterte “for lack of sincerity,” following an NPA ambush on November 9, 2017 that killed a four-month old Walysha Manchorao, and similar incidents. The President subsequently signed Proclamation 374, designating the Communist Party of the Philippines and its armed wing, New People’s Army, as terrorist organizations. The GRP and NDFP peace panels had earlier agreed on three common drafts on general amnesty and release of all political prisoners in compliance with 1998 Comprehensive Agreement on Respect for Human Rights and International Humanitarian Law; coordinated unilateral ceasefires; and part I of Agrarian Reform and Rural Development and part II of the National Industrialization and Economic Development. “We are now at the cusp of some major breakthroughs in the peace talks hence the urgent need now to take deliberate steps to ensure that we do not falter. Just, sustainable and lasting peace will happen only when our people understand and support these efforts,” he said. But Bayan Muna Rep. Carlos Isagani Zarate said the cancellation of the June 28 peace talks was unnecessary and that Dureza must not use the issues he raised as stumbling blocks or preconditions as both panels could address them while the talks are ongoing. He said the delay would allow “peace spoilers and saboteurs” longer time to derail the GRP-NDFP peace process. “The Filipino people have long supported the peace talks for a just and lasting peace. Indeed, addressing the root causes of the armed conflict like landlessness, oppression and exploitation, among others, will certainly get the continued support of the majority of Filipinos,” Zarate added.